As the U.S. dollar has finally taken a breather, GLD has been on the rise. There is no doubt in my mind that holding physical gold is a superior, and safer way to invest in the one alternative currency that will still exist when the lights go out. But that is not, in my opinion, how one should go about trading gold. In fact, the best way to do that, or to manage the tip of the spear when adjusting one's overall exposure to the space, would be through gold futures or an ETF such as SPDR Gold Shares ETF (GLD - Get Report) . Just to be clear, this is about trading and risk management. On the day that the lights go out forever, positions in the ETF or gold futures won't do the individual any more good than their favorite cryptocurrency, but actual gold might be useful. Physical gold will also be useful as a store of value on the day that misguided policies result in a failure of faith in fiat currency. Just make sure that it's not stored a thousand miles away. All that aside, as the U.S. dollar has finally taken a breather, GLD has been on the rise. With equity index futures responding well to news out of China, and news imminently due from the Bureau of Labor Statistics, as well as the Fed Chair himself, is there still opportunity here? Has that ship sailed? Let's take a look. How interesting. As fear surged in late Thursday trading, so did the last sale of GLD. Just as interesting, as equity index futures indicate a higher open Friday morning, the last sale is off a bit. 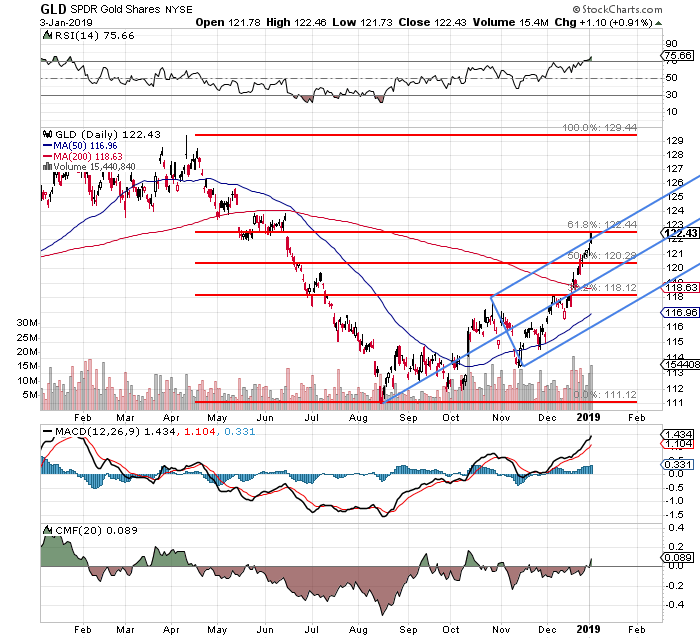 What the chart immediately reveals is that Thursday's closing price left GLD at both a 61.8% retracement of the April through August selloff, and simultaneously at the upper trend line of the August through the present Pitchfork model. Obviously, those two observations, on top of Relative Strength of more than 75, and a daily MACD that has not offered an overt sell signal since October, would normally indicate resistance. Expect to see some ahead of Powell's appearance. In addition, watch the converging 50-day and 200-day SMAs, currently only $1.67 apart after being about $4 apart just a month ago. A "golden cross" (no pun intended) might be what this market needs to punch through. Like I said, this is not about physical gold. As for this ETF, if one is long (and I am), this is the likely destination to take some short-term profit. Frankly, I would not take it all off this morning, as Powell is no Mario Draghi when it comes to soothing markets. Should Powell incite panic later today, this fund could resume its march toward the highs of last April on resumed dollar strength. Should Powell give markets the juice they crave, the add here is between $120 and $118.